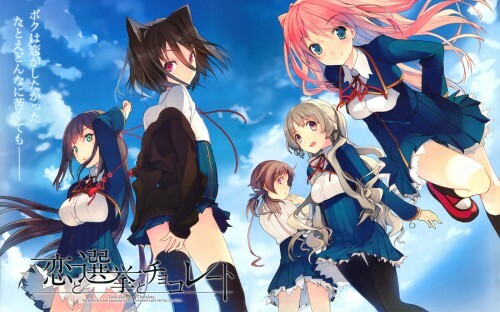 Koi to senkyo to chocolate, an eroge from sprite just announced to get anime adaptation. The January issue of ASCII Media Works’ Dengeki G’s Magazine is announcing a 2012 television anime adaptation of sprite/fairys’ Love, Election, & Chocolate (Koi to Senkyo to Chocolate) adult game on Wednesday. The 2010 Windows game follows the protagonist at a “mega academy” with over 6,000 students. To save his cooking club from being abolished, the protagonist agrees to run for student body president. And again, as usual, I need to prepare for art quality degradation compared to original art. At least I’m not a big fan of Akinashi Yuu (and Koichoco being the only eroge art he/she ever done) though it’ll still be sad seeing it degrades. No information on animation studio or pretty much everything else.